"This is, to our best knowledge, the first global assessment of the life cycle of greenhouse gas emissions from all plastics," said author Sangwon Suh, a professor at UC Santa Barbara's Bren School of Environmental Science & Management. 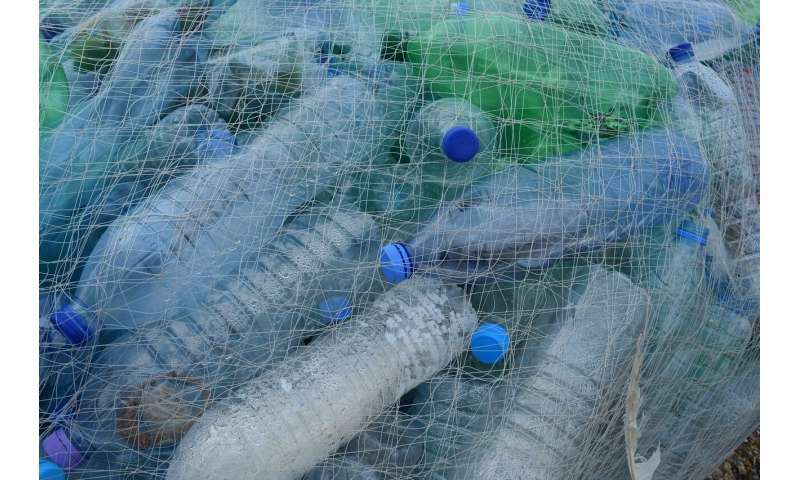 "It's also the first evaluation of various strategies to reduce the emissions of plastics." Plastics have surprisingly carbon-intense life cycles. The overwhelming majority of plastic resins come from petroleum, which requires extraction and distillation. Then the resins are formed into products and transported to market. All of these processes emit greenhouse gases, either directly or via the energy required to accomplish them. And the carbon footprint of plastics continues even after we've disposed of them. Dumping, incinerating, recycling and composting (for certain plastics) all release carbon dioxide. All told, the emissions from plastics in 2015 were equivalent to nearly 1.8 billion metric tons of CO2. And researchers expect this number to grow. They project the global demand for plastics will increase by some 22% over the next five years. This means we'll need to reduce emissions by 18% just to break even. On the current course, emissions from plastics will reach 17% of the global carbon budget by 2050, according to the new results. This budget estimates the maximum amount of greenhouse gasses we can emit while still keeping global temperatures from rising more than 1.5 degrees Celsius. "If we truly want to limit global mean temperature rise from the pre-industrial era below 1.5 degrees Celsius, there is no room for increasing greenhouse gas emissions, not to mention substantially increasing greenhouse gas emissions like what we have projected for the life cycle of plastics," said Suh. In addition to diagnosing the problem, Suh and lead author Jiajia Zheng, a Bren School graduate student, evaluated four strategies for reducing plastic's carbon footprint. Slowing the rising demand for plastics could also limit their emissions, but Suh admits this would be a tall order. Plastics are versatile, cheap and ubiquitous. Scientists are working on alternatives, but nothing has dethroned plastic quite yet. What's more, as developing countries modernize more people will enjoy a plastic-rich modern lifestyle. Ultimately, Suh and Zheng found that replacing fossil-based energy with renewable sources had the greatest impact on plastic's greenhouse gas emissions overall. Transitioning to 100% renewable energy—a purely theoretical scenario, Suh concedes—would reduce emissions by 51%. "We thought that any one of these strategies should have curbed the greenhouse gas emissions of plastics significantly," Suh said. But they didn't. "We tried one and it didn't really make much impact. We combined two, still the emissions were there. And then we combined all of them. Only then could we see a reduction in future greenhouse gas emissions from the current level." The study's results underscore just how large an effort is needed to meaningfully reduce greenhouse gas emissions. "The public really has to understand the magnitude of the challenge that we are facing," Suh said. To that end, Suh has focused on how to best leverage the renewable energy we do produce. "The question is, what is the biggest bang for the kilowatt hour of renewable energy?" he said. For instance, does 1 kWh of renewable energy offset more emissions when it's directed toward domestic use, transportation, or some other application? After working with such large numbers, one thing has become clear to Suh: "What I'm seeing is that greenhouse gas emissions reduction will not happen unless we really make efforts at an unprecedented scale."